Location/ Directions: Take I-70 to Hamilton Road, Exit 107A. Turn left onto Hamilton Road and turn right on Groves Road. Immediate right on the service road. About Hotel: 3-Floors, 79-Rooms, Interior Corridors, Business Center, Fitness Room, Pool, No Pets Allowed, Beverage Area (Complimentary), Coin Laundry, Elevators, Easy to Set Alarm Clock Radio, TV - 25 Inch, Coffee Maker, Complimentary Hot Breakfast, Hairdryer, High Speed Internet-No Charge, Iron/Ironing Board, Lap Desk, Cribs, High chairs. Railroad View: Questionable Fair View. You must have a room on the 3rd floor on the rear of the motel (north side). There is a self storage business behind the motel that may block much of the railroad view. The open area where you should be able to see the railroad could be blocked by parked strings of grain hoppers. Those are loaded at grain silo just west of the motel. The grain folks use a EMD switcher to shuffle the cars around. The siding / yard is on the motel side of the mainline, meaning passing freights maybe blocked by the parked rail cars. Railroads past Hotel: Norfolk Southern (former Conrail / TOC). Photo Comments: Above Photo: This photo was taken from the Route 317 overpass that runs along the east side of the motel. Here we are close to the same "3rd-Floor" level as the motel rooms that offer a railroad view will have. Behind the storage facility, you can see the grain hoppers parked which are held in the yard owned by the grain company. These rail cars will block the view of mainline freight trains as the main is on the north side of the customers rail yard. This day is an example of not a very day to stay in this "railfan motel"! 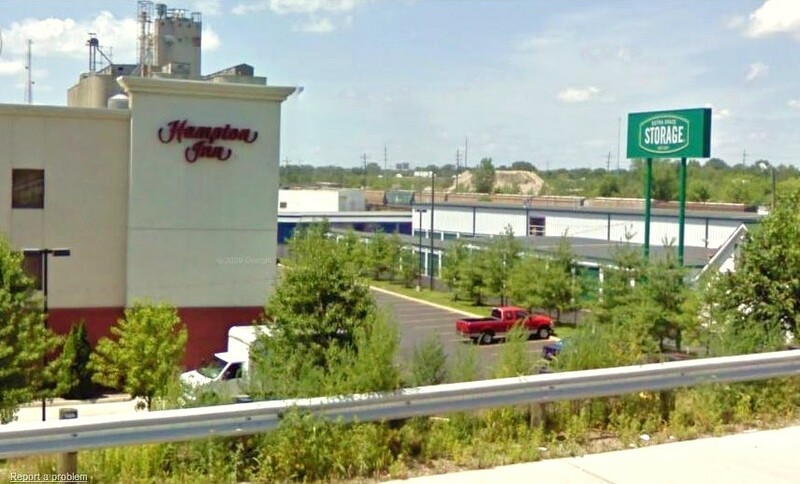 Left photo: The aerial view shows the Hampton Inn near the top of the picture. 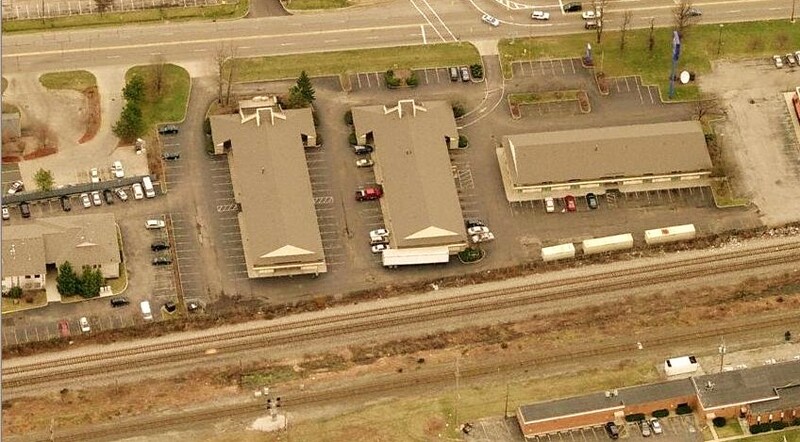 A self serve storage business has two buildings between the motel and the railroad. 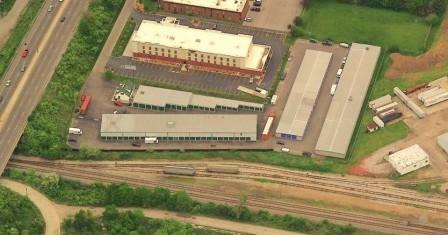 The storage building closest to the railroad is 2-floors, which really fouls much of the railroad view. The double track mainline is seen along the bottom of the photo, a couple grain cars are staged in the yard. This day would be have been a good day to stay in this "Railfan Motel" as there were no rail cars blocking the view between the motel and the mainline. The aerial photo looks southward. Location/ Directions: Take I-270 North(Cleveland) to state route 23 North exiting towards Delaware. Turn right on East Campus View Blvd. and at the 2nd light turn right onto Huntington Park Drive. Follow around until you see the hotel entrance signs on left. About Hotel: 4-Floors, 104-Rooms, Interior Corridors, Complimentary on-site parking, Pets allowed (fee), Air conditioning, Alarm clock, Crib, Individual climate control, Iron and ironing board, Hair dryer, Color Cable/satellite TV, Fireplace, Conventional oven, Dishwasher, Microwave oven, Pots, pans, serving dishes, Refrigerator with icemaker, Silverware, Stove, Table and chairs, Toaster oven, Two-line phone with voice-mail, Buffet breakfast, Coffee in lobby, Coffee/tea in-room, Fitness Room, Outdoor Pool, Whirlpool. Railroad View: Fair to Good View, many trees prevent a good view from many rooms. The NS tracks are next to the motel, trains pass at fast speeds. The CSX single track is a little further away, and not as busy as the NS line. You can not see trains at night very well. The windows open all the way, protected by a screen. The trains are loud as they pass, but do not blow their horn past the motel. Rooms with the best railroad view are (in order): 428, 328, 228, 427, 327, 227, followed by 412, 312, 212, 414, 314, 214. All other rooms offer only a poor view due to trees. Even room numbers are on the railroad side of the building. Railroads past Hotel: Norfolk Southern [Columbus-Marion-Bellevue Line] / CSX [Columbus-Crestline-Cleveland] (joint lines run side by side). Railroad Radio Frequencies: 161.190 (NS) / 160.860 (CSX). 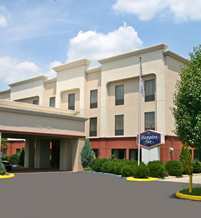 Notes: This motel is not far from the Ohio Railway Museum in Worthington, OH. Its also within an hours drive of the popular train watching spot in Marion, Ohio. Comments: During my 17-hour stay 19 trains passed the motel; 16 of which were Norfolk Southern trains. 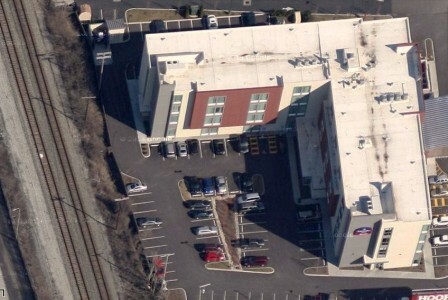 Photo Comment: The aerial photo shows the Residence Inn next to the railroad tracks. The tracks closest to the motel belong to CSX, the pair is the former Conrail line that runs north through Crestline, OH. The single track along the bottom of the photo is the Norfolk Southern (former N&W / PRR) line that runs north through Marion, OH to Bellevue, OH. 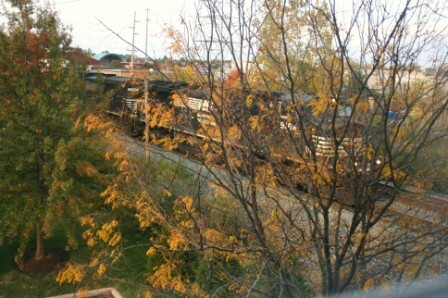 Right: A southbound Norfolk Southern train passes the motel as seen from room # 328. This room is one of the best in the motel as far as railroad view goes. Although its not a clear view; the average railfan should get enjoyment with the hourly rail action from this motel. About Hotel: 3-Floors, 136-Rooms, Exterior Corridors, Air Conditioning, Restaurants Nearby, Non-Smoking Rooms, Pets Welcome, Satellite TV, Guest Laundry, Truck and Bus Parking, HBO, WiFi Available, Semi-Indoor Seasonal Pool (Open from May to September). Notes: This is a former Cross Country Inn motel (that motel chain went out of business). I have stayed here several times during the 1990's. The motel was nothing fancy, and always packed with customers likely due to the price. Although I enjoyed my stays, I remember getting sleep wasn't the easiest. The trains do not blow their horn near the motel, but they are very loud, the sound of the engines... then train noise bounces from one building to the next. My greatest memory from this motel was when I was abruptly awaken during the night by a Southern Pacific tunnel motor running at notch-8. It was the loudest thing I've ever heard! Too bad I wasn't awake to really enjoy it, but at least I was able to sneak a peak at it. My last stay at this motel wasn't the best, people in the motel parking lot all night long, slamming car doors, and talking like they are at a football game. The noise from the train's were the least of my worries that night. 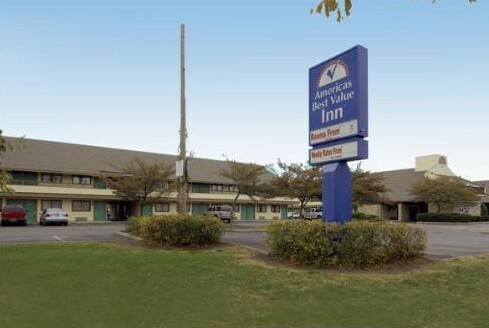 Comments: This motel is not far from the Ohio Railway Museum in Worthington, OH. Its also within an hours drive of the popular train watching spot in Marion, Ohio. Photo Comment: The aerial photo faces eastward. The three buildings in the center of the picture are the Americas Best Value Inn motel. As you can see, the building to the right is the building with the preferred railroad view. Second floor rooms will keep you above the parking lot. Those trailers parked along the railroad were not present during any of my stays. The motel has exterior corridors which will help if you are looking to photograph or video passing trains. As for the railroad, you can see all 3-tracks in the picture. The double track main closest to the motel is Norfolk Southern's main from Columbus to Bellevue, Ohio. The single track farthest from the motel is CSX's former Conrail line that runs between Columbus north through Cresline, Ohio. Above: These photo's were taken from the exterior corridor of the south building. The left photo looks south, the right photo looks north at the railroad tracks. The tracks are just out of view behind the bushes. The railroad is slightly elevated (several feet above the motels parking lot), meaning had a train of been passing during these pictures, you would be able to see most of the train (minus the trucks). Getting engine numbers will be easy from this motel, photo's just will not be as good as the Motel 6 located a couple doors down. Location/ Directions: Traveling on I-71, Exit at Sinclair Road, Exit #116. Follow Sinclair Rd south and the Motel 6 will be visible on the right. About Hotel: 2-Floors, 46-Rooms, Exterior Corridors, Free Local Calls, Free Morning Coffee, Free Expanded Cable, Free Wi-Fi, Kids Stay Free, Pet Allowed, Restaurant Nearby. Railroad View: Excellent View. Any room on the railroad side of the buildings will give you a railroad view. North end rooms are best. 2nd floor rooms keeps you above the parking lot. Night-time train watching is easy, and trains are well lite by the parking lot lights. The trains are very loud as they pass, you will not miss any! No horns, just engine noise and rail car travel will let you know they are passing, even if you are a heavy sleeper. The windows do not open. Railroads past Hotel: Norfolk Southern [Columbus-Marion-Bellevue Line] / CSX [Columbus- Crestline-Cleveland] (joint lines run side by side). This is a busy area to watch trains. About 40 trains during a 24-hour period pass this motel. A majority of the trains are Norfolk Southern's. I logged 19 trains during my 12-1/2 hour stay. Comments: Expecting an average, heavily used Motel 6, I was quite surprised to find a "Brand New Room"! I was not yet aware of the new Motel 6 makeover. New beds, floors and furniture were quite welcoming in this room. I had room # 228 which had an excellent view of the railroad. For those equipped with a radio-scanner, the following frequency's were used during my stay: 160.800 (CSX), 160.980 (NS Disp.) , 160.860 (? ), and 161.190 (NS Columbus Disp.). Photo Comment: Above: A northbound Norfolk Southern train passes a southbound train in front of the motel. This is the view from corner room# 228. The exterior corridors provide a place to take in all the action. That container and dumpster were an eyesore during my stay, but they are only temporary while workers are remodeling the motel rooms. I requested a room on the rear to watch trains, but I think they were putting guests in the front rooms so they didn't see this side of the motel. Above Right: An SCWX coal train take a quick stop on the CSX line at 1:47am in the morning. I couldn't pass up the opportunity to take a night photo shot from inside my room, looking out the window. The windows do not open, but that means there is no screen to mess up a picture, just exterior light shining onto the drapes creates a reflection. As you can see, light is no problem during night-time train watching. Trains pass around the rate of 2 per hour on average. Location/ Directions: I-71 to Columbus. To exit 106A-106B on the LEFT to merge onto OH-315 N toward Worthington. Travel 2 miles and take the Goodale St exit toward Grandview Heights. Turn right at W Goodale St. Turn right at Olentangy River Rd. Travel 1.1 miles to 1421 Olentangy River Rd. About Hotel: 4-Floors, 136-Rooms, Interior Corridors, High-speed Internet, Free high-speed Internet, Free breakfast, Fitness center, Business center, Heated Indoor Pool, Smoke-free Hotel, Pets not allowed, Air conditioning, Alarm clock, Coffee maker/tea service, Crib, Individual climate control, Iron and ironing board, Mini fridge, Hair dryer, Color Cable/satellite TV, Microwave oven, Phone with voice mail, Onsite exercise room. Railroad View: Excellent View. Any room on the rear of the motel will offer a railroad view. Railroads past Hotel: CSX (former C&O Railroad). Expect around 15 trains on this line during a 24-hour period. About 45-minutes north of here is the railfan hotspot of Marion, Ohio. Trains traveling on this line can also be seen in Marion. Photo Comment: Here one picture that will say a thousand words; Room on the rear side of the SpringHill Suites have an excellent view of the railroad. Location/ Directions: I-71 to Columbus. To exit 106A-106B on the LEFT to merge onto OH-315 N toward Worthington. Travel 2 miles and take the Goodale St exit toward Grandview Heights. Turn right at W Goodale St. Turn right at Olentangy River Rd. 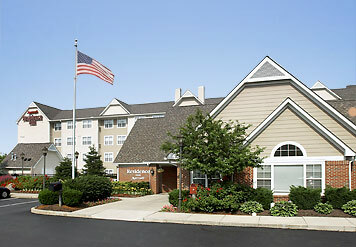 Travel 1 mile to 1445 Olentangy River Rd. About Hotel: 2-Floors, 119-Rooms, Interior Corridors, Hairdryer, Iron and Iron Board, Microwave and refrigerator some rooms, Cable TV, High-speed wireless Internet access, Work area with a desk and chair, Free local calls, Coffeemaker, Clock radio. Railroad View: Excellent View! Ask for a room on the rear side of the north building. Just request a view of the railroad as its only a matter of feet from the rooms. 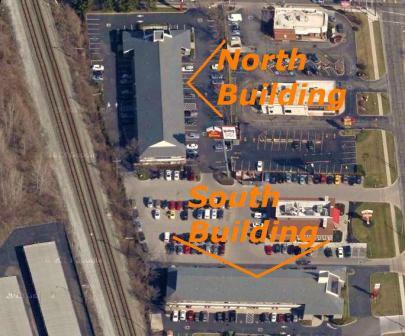 Photo Comment: The Varsity Inn consists of two building, although 3 of 4 building sides will offer a railroad view, the best view should be on the rear (west side) of the north building. These rooms face the track directly. 2nd floor rooms will keep you above the parking lot and the fence that separates the parking lot and the railroad. This rail line sees about 15 trains during a 24-hour period. Location/ Directions: From I-71, Exit Broad Street and travel west to High St. Travel north on High St. to Nationwide Blvd. Hotel is on west side of street. 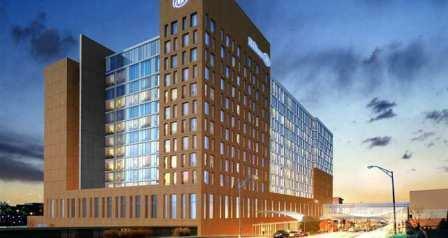 About Hotel: 12-Floors, 532-Rooms, Interior Corridors, Hotel is 100% Non-Smoking, Parking (fee), Pets allowed, Business Center, Cribs, High chairs, Restaurant, Bar Area, Concierge Desk, Elevators, Gift Shop, Laundry/Valet Service, Room Service, Bicycle Rental, Fitness Room, Pool, 42-inch flat-screen television, Alarm/clock/radio with MP3 connection, Large desk with ergonomic chair, Laptop-size in-room safe, Dual-line telephone with voice mail, Iron/board, Mini-refrigerator, Hair dryer. Railroad View: Excellent View. Any room on the south side of the hotel will face the railroad. Current construction near the railroad may change or block the railroad view from this hotel in the future. Railroads past Hotel: CSX Transportation (former Conrail). 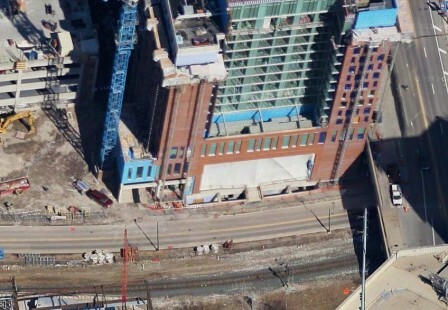 Photo Comment: The aerial photo shows the Hilton under construction. The single track runs between the site of the former Union Station (located across from the Hilton, now site of the convention center), and Hocking Interlocking / HV Junction. For the history buffs; about a 15-minute walk southwest of the Hilton is Arch Park, a park where one of Union Station's arches still stands. Location/ Directions: Take I-71. Merge onto OH-315. Take Goodale St Exit. Turn right onto Goodale St. Turn right onto Yard St. Hyatt Place Columbus/OSU will be on left-hand side. Two telephones (one cordless) with voicemail, Hair dryer, 42" flat-panel HDTV featuring HD channels, AM/FM alarm clock radio with MP3 connectivity, Large desk area, Mini-refrigerator, Iron/ironing board, Pets Allowed. Railroad View: Excellent View. Any room on the east side of the motel will offer a railroad view...unless someone builds something across the street. Railroads past Hotel: CSX Transportation (former C&O, Hocking Valley Railroad). This line sees about 12-15 trains during a 24-hour period. Its the same line that runs through the busy train watching town of Marion, located about an hour north of this motel. 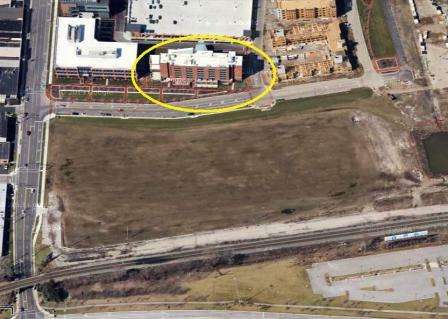 Photo Comment: The aerial photo shows the Hyatt Place circled in yellow. The double track railroad is seen along the lower part of the photo. This location is just north of Hocking Junction (HV Junction), and is also within walking distance of the former Conrail / Penn Central / Pennsylvania RR Grandview Yard - today only a few side tracks remain, mostly empty and unused. This picture looks westward.